Identification: Nymphaea odorata is an aquatic perennial plant. Its leaves have a thick waxy coating, are nearly circular with a notch at the center. Found floating on the surface of the water, they measure anywhere between 8-14". The plant consists of continuously growing horizontal stems, called rhizomes, which spread out laterally and produce flowers on top of, and slightly above, the water. The rhizomes are approximately 2-3 cm in diameter. Growing in clusters below the rhizomes are the roots which are covered with short black hairs. Flowers rise from petioles, or long slender stalks, which are purplish at the base. Flowers can measure up to 25 cm across and have yellow centers surrounded by 25 or more petals. Flowers are fragrant and can be white or pink with yellow centers. Once the flower dies the stalk forms a spiral and draws its fruit down below the water. The fruit is an ovoid like berry containing many seeds. The flower opens in the morning and closes in the late afternoon. When not blooming Nymphaea might be confused with Nuphar advena a yellow lily whose common name is Cow Lily. It grows in quiet waters: ponds, marshes and slowly moving streams. Current Distribution: Western North America, particularly Washington State, Oregon, Montana. Site and Date of Introduction: It is believed that the fragrant waterlily was introduced into Washington during the Alaska Pacific Yukon Exposition held in Seattle in the late 1800s. Waterlily culture in the western hemisphere began in 1786 when Nymphaea was first introduced into the large estates and botanic gardens of England. Mode(s) of Introduction: Directly dispersed and transplanted by human beings for decorative purposes in ornamental ponds and lakes via commercial sales. Reason(s) Why it has Become Established: Although beautiful and delicate in appearance, the waterlily is a hearty plant. There are multiple reasons why it proliferates. It is a perennial plant which can grow in as low as 6" deep water and up to 7' deep. It can survive in either acidic or alkaline water. The flower has a clever method of capturing and trapping pollen coated insects (bees, beetles, flies), by absorbing the pollen via liquid in the center of the flower therefore causing fertilization. Also, seeds float on the surface of the water for several days, waterfowl eat the seeds and are therefore spread to other areas or by way of water currents. 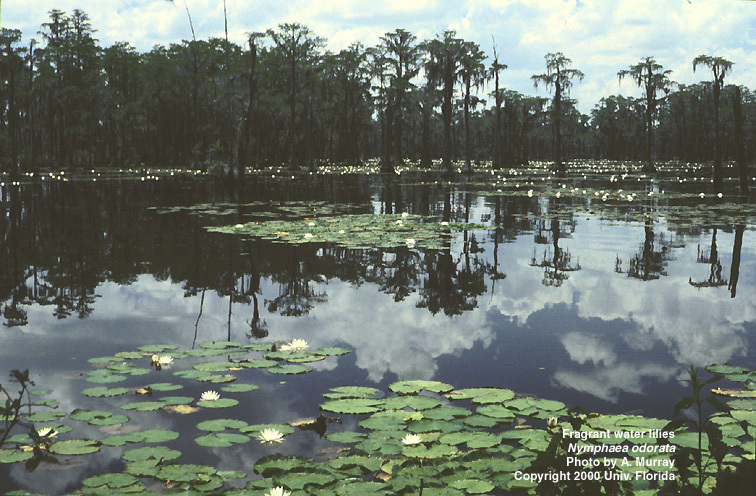 Ecological Role: Nymphaea grows aggressively and forms dense mats smothering and competing for resources with other native species (such as Nuphar advena) significantly reducing aquatic plant and animal biodiversity. Aqueous extracts from leaves, petioles, and rhizomes of white waterlily exhibit high allelopathy potential and are reported to inhibit seed germination and root growth of native aquatic plants. Extensive infestations (can cover up to hundreds of acres) of macrophytes (an aquatic plant large enough to be seen by the naked eye) change the PH water quality. The dense canopy of the Waterlily's leaves disrupts light penetration, reducing oxygen levels thereby creating stagnation which is prime mosquito breeding habitat. Infestation of the waterlily may attract other non-native exotic species which can tolerate low oxygen levels but disrupts the biodiversity. Benefit(s): The seeds, roots and leaves of the plant serve as food for fish, ducks, beaver, moose and deer. Native American Indians came to use the roots for medicinal purposes. It provides cover for large mouth bass, sunfish and frogs. It goes without saying that one of the benefits is its aesthetic value. Threat(s): As mentioned above can potentially disrupt biodiversity. Can impacts human endeavors by smothering swimming and boating areas. Is also known to clog irrigation drains and ditches. Control Method: As with all invasive species, management requires a long term investment of human and financial resources. There are no known biological control methods. Grass carp fish was tested but unsuccessful. Physical methods consist of cutting, harvesting and picking the leaves which will eventually kill the plant. Chemical controls consists of aquatic herbicides. Other methods involved covering with bottom barrier materials but it is said that rotovation is best.